On Wednesday 29 August, a demonstration of traditional Japanese dance, jointly organized by the Consulate General of Japan and the Konokai Wakayagi School of Traditional Japanese Dance, took place at The Japan Society of Hong Kong. The event was open to the general public and included a lecture about the history of traditional Japanese dance, followed by a demonstration. The talk provided a brief overview of the history, different schools and styles of traditional dance, as well as an introduction to the music, costumes and accessories used by performers. After the lecture, several examples of traditional Japanese dance were performed by the lecturers, and then the participants got the chance to try out some traditional dance movements for themselves. 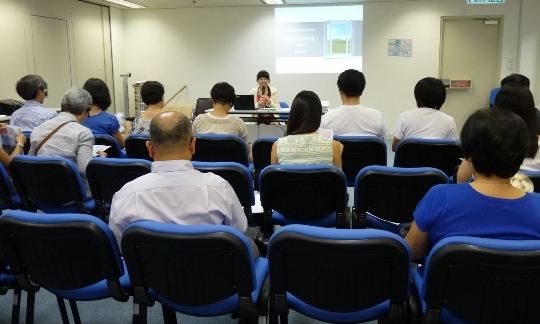 Throughout July and August, a special summer series of Japanese cultural talks were held at the multi-function room of the Consulate General of Japan. 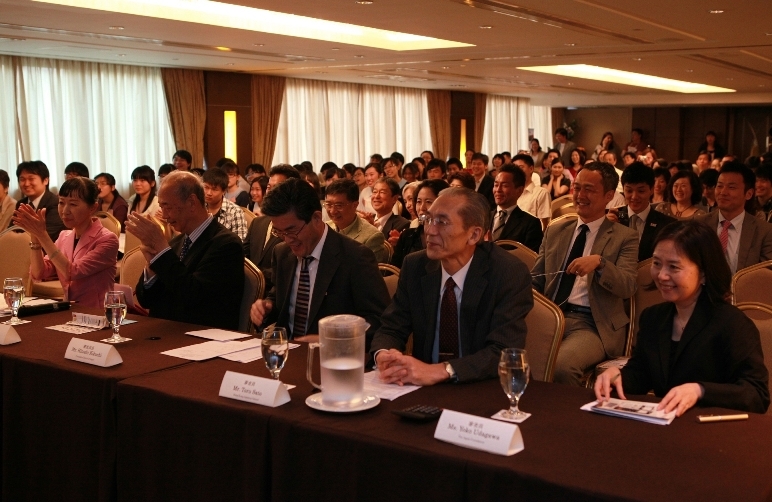 The topics varied from week-to-week, but all of the talks were presented with the intention of stimulating the participants’ interest in Japanese Culture. The series of talks included: a seminar on Japanese Culture and a free-talk session in Japanese, an Origami (paper-folding) Workshop, a Japanese Film Show, Japan Free Walker – sharing travel experiences in Hokkaido, an Introduction to the Japanese Tea Ceremony, Learning Japanese through Karaoke, and a session on How to Wear a Yukata. On Friday, 22 June, the Consulate-General of Japan welcomed students from City University Community College to a Japanese tea ceremony. 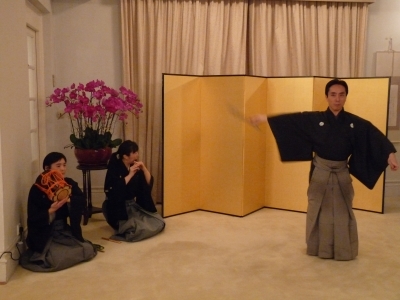 The ceremony, which was jointly organized with the Chado Urasenke Tankokai Hong Kong Association, took place in the consulate’s multi-function room. 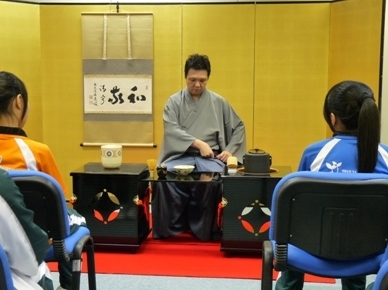 After watching an explanation and demonstration of the ceremony, the 41 students and teachers had a go at making some tea for themselves, and gained a valuable insight into this highly representative aspect of traditional Japanese culture. plus travel presentation and free-talk on wasabi! 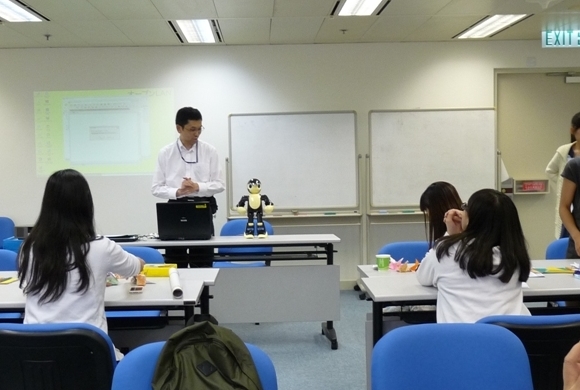 On Friday, 15 June, a robot demonstration and origami (paper folding) workshop were held at the multi-function room of the Consulate General of Japan, followed by a presentation about travelling to the Tohoku region and a free-talk session in Japanese. The robot demonstration was given by Mr. Ono, Consul of the consulate’s Public Relations and Cultural Affairs Division, and the other activities, including the origami workshop, were conducted by the consulate’s local staff. After the origami workshop, there was an “experience sharing” talk by a recent visitor to Sendai, in the Tohoku region. And the afternoon ended with guests being invited to talk freely in Japanese on the topic of “wasabi” and its importance in Japanese culture and cuisine. It was a varied programme, covering modern technology, traditional arts, interesting information and free-ranging discussion, and it gave the participants an insight into a number of important aspects of Japanese culture. 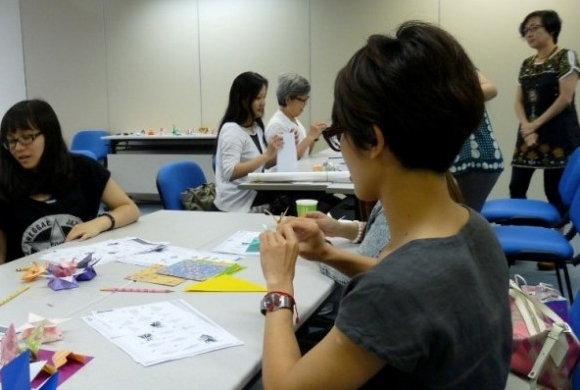 On Friday, 20 April, Haiku (poetry) and Origami (paper folding) workshops were held at the multi-function room of the Consulate General of Japan, followed by an “experience sharing” presentation about travelling to Japan. The Haiku workshop was conducted by Mr. Hitoshi KIKUCHI, Director of the consulate’s Public Relations and Cultural Affairs Division, and the Origami workshop was conducted by the consulate’s local staff. 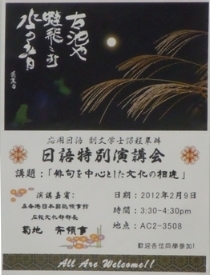 After the Haiku and Origami workshops, there was a presentation about travelling to Okinawa Prefecture in Japan. This session introduced the attractions of Okinawa Prefecture, such as its renowned scenery, famous produce and regional cuisine, through photographs of Naha and Ishigaki Island and an interesting “experience sharing” talk by a recent visitor to the prefecture. 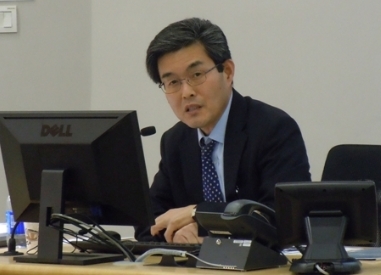 On Monday, 23 April, Mr. Hitoshi KIKUCHI, Director of the Consulate’s Public Relations and Cultural Affairs Division, gave a seminar at the Chinese University of Hong Kong on “The characteristics of Japanese Culture that distinguish it from other cultures”. 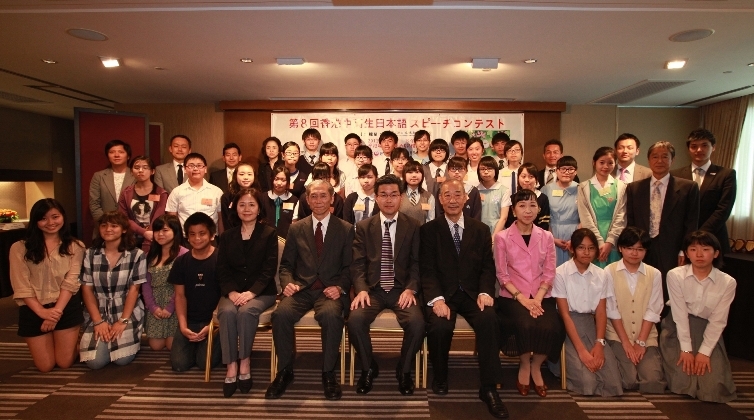 About 50 students studying “Modern Sino-Japanese Relations” joined the seminar. 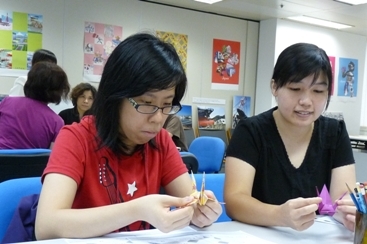 On Friday, 20 April, the Consulate General of Japan held a Haiku (poetry) and Origami (paper folding) Workshop. The workshop was conducted by Mr. Hitoshi KIKUCHI, Director of the Consulate’s Public Relations and Cultural Affairs Division, and took place in the consulate’s multi-function room. 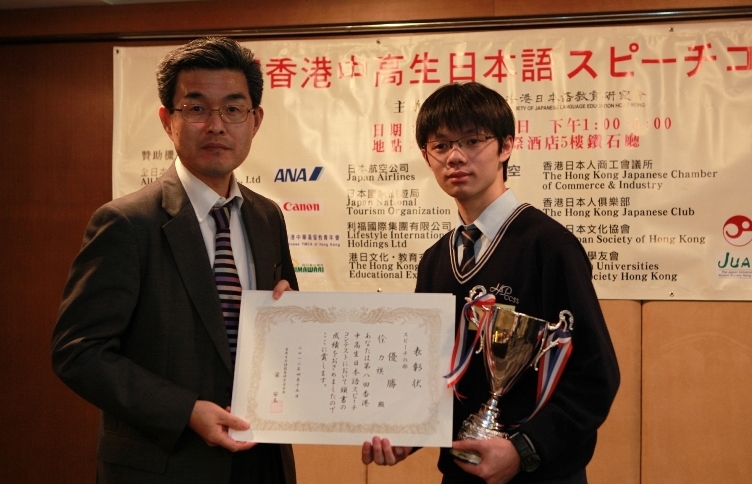 The 8th Hong Kong Secondary School Students Japanese Speech Contest, organized by the Society of Japanese Language Education Hong Kong and supported by the Consulate-General of Japan, was held on Sunday 15 April. 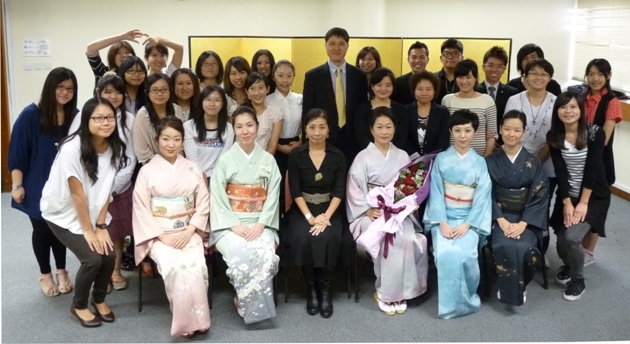 On Wednesday, 21 March, Mr. Hitoshi Kikuchi, Director of the Consulate’s Public Relations and Cultural Affairs Division, gave a seminar on Japanese culture to 80 City University Community College students. During the seminar, Director Kikuchi talked about the main characteristics of Japanese culture, including those aspects that distinguish it from other cultures, and urged students to develop greater awareness of the history of their own place of birth. 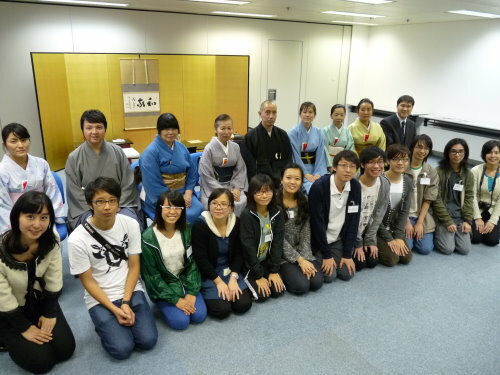 On Friday, 2 March, a welcome-back reception for this year’s participants in the Hong Kong and Macau High School Students Visit Japan Project was held at the multi-function room of the Consulate-General of Japan in Hong Kong. The students visited Japan in December last year, under a project organized by the Japanese Government as part of the Japan - East Asia Network of Exchange for Students and Youths programme (JENESYS). This visit was the last under the project, which was launched in 2008 and reached its final year in 2011. Representatives from the education bureaus of Hong Kong and Macau attended the reception, together with thirty-two student delegates from Hong Kong and ten student delegates from Macau, as well as their teachers. Speaking at the reception, the Consulate’s Director of Public Relations and Cultural Affairs, Mr. Kikuchi, greeted the students and expressed his hope that they would stay in touch with each other by arranging reunions. A number of student representatives then delivered enthusiastic reports about their visit to Japan, in fluent English and Japanese. They shared their experiences of Japanese high-school lessons and talked about their home-stays with local families in Kumamoto Prefecture. All of the students were delighted to have had the opportunity to learn more about Japanese culture through this exchange with high school students in Japan, and were glad to have been able to visit a country that they really like. On Thursday, 9 February, Mr. Hitoshi KIKUCHI, Director of the Consulate’s Public Relations and Cultural Affairs Division, was invited to conduct a haiku workshop at City University Community College. 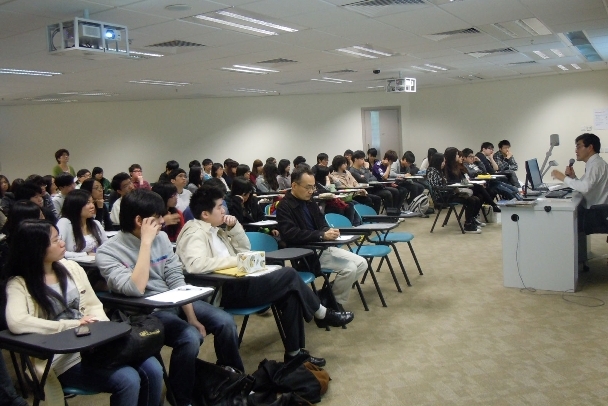 A total of 140 students, all belonging to the college’s Department of Language Studies, joined the workshop. Using a PowerPoint presentation, Director Kikuchi introduced the history of haiku, talked about the philosophy involved in composing haiku, and explained the importance of seasonal-change imagery in haiku poems. He also explained the background and meaning of some famous haiku. After the presentation, the students tried composing their own haiku on a set theme. And in his closing remarks, Director Kikuchi pointed out how difficult it is to compose haiku in Hong Kong, given the fact that seasonal changes here are not as obvious or visually dramatic as elsewhere. He suggested that it would be worth visiting Japan in order to develop a true understanding of the seasonal changes that have inspired the composition of outstanding Haiku! On Tuesday, 29 November, the Consulate-General of Japan welcomed students from the Chinese University of Hong Kong’s School of Continuing and Professional Studies (CUSCS) to a Japanese tea ceremony. 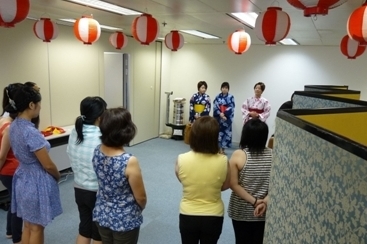 The ceremony, which was jointly organised with the Chado Urasenke Tankokai Hong Kong Association, took place in the consulate’s multi-function room. After watching a demonstration of the ceremony, the 50 students and teachers had a go at making some tea for themselves, and gained a valuable insight into this highly representative aspect of traditional Japanese culture. 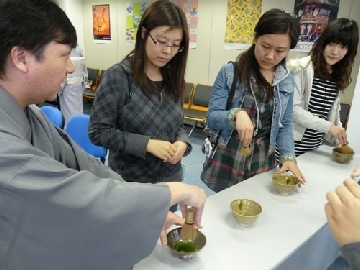 On Wednesday, 23 November, the Consulate-General of Japan welcomed students from the Chinese University Hong Kong’s Department of History to a Japanese tea ceremony. The ceremony, which was jointly organized with the Chado Urasenke Tankokai Hong Kong Association, took place in the consulate’s multi-function room. 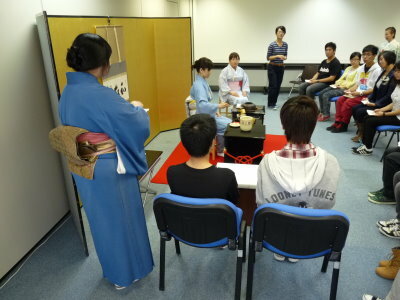 After watching a demonstration of the ceremony, students had a go at making some tea for themselves, and gained a valuable insight into this highly representative aspect of traditional Japanese culture. On Saturday 29 October, students from The Hong Kong Polytechnic University (PolyU) took part in a dance demonstration and workshop jointly organized by the Consulate General of Japan and the Konokai Wakayagi School of Traditional Japanese Dance. The students, who were all from PolyU’s Department of Japanese Studies, were given a lecture about the history of traditional Japanese dance, followed by a demonstration. The talk included a brief overview of the different schools and styles of traditional dance, as well as an introduction to the music, costumes and accessories used by performers. After the demonstration, the students themselves got the chance to try out some traditional dance movements, and had fun trying to master moves that included the skillful use of Japanese folding fans. 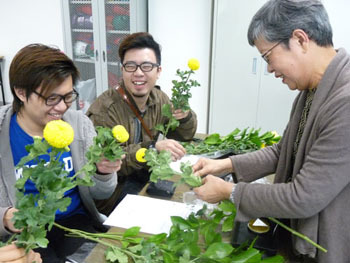 On Wednesday, 10 August, the Consulate-General of Japan played host to an ikebana (Japanese flower arrangement) demonstration and workshop that was organised in co-operation with the Hong Kong Chapter of Ikebana International. The 24 participants included members of the Youth Online-Stewards Integrated Service Centre for Young People, as well as members of the general public. After listening to an introductory talk about the tools and basic methods used in flower arrangement, the participants got a chance to create their own works, and they all gained a wonderful insight into this highly representative example of traditional Japanese culture. On Tuesday, 19 July, the Consulate-General of Japan welcomed students from STFA Yung Yau College to a Japanese tea ceremony. The ceremony, which was jointly organized with the Chado Urasenke Tankokai Hong Kong Association, took place in the consulate’s multi-function room. After watching a demonstration of the ceremony, the 37 students and teachers had a go at making some tea for themselves, and gained a valuable insight into this highly representative aspect of traditional Japanese culture. 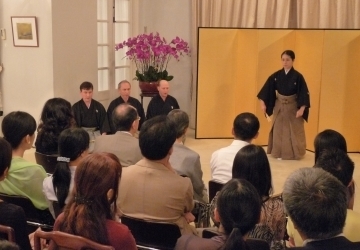 On Tuesday 5 July, 45 Japanese language professionals and people who actively promote Japanese culture in Hong Kong attended a Noh theatre workshop at the residence of the Japanese Consul-General. The workshop was presented by Japan’s Kita-ryu Oshima Noh-gaku Do (Oshima Noh Theatre) in collaboration with ‘Theatre Nohgaku’, an international company of Japanese and North American-based members. The companies joined together again on Wednesday 6 July to stage two Noh works, as part of their “Asian Noh Tour 2011”, at the Hong Kong Academy for Performing Arts. They presented the classic Noh “Takasago” alongside “Pagoda”, a contemporary piece written by the Chinese-British writer Jannette Cheong. 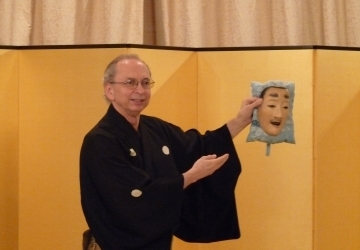 “Takasago” is a well-known classic of traditional Noh that portrays the aspirations of security, prosperity and longevity, for the country and its people, through a poetic legend. “Pagoda” is a modern Noh play about the writer’s journey to her father’s birthplace. It is performed in English, but arranged in traditional Noh style, and deals with subtle and profound themes by drawing on family experiences and ancient Chinese legends. By bringing together classic and contemporary Noh works in one performance, with a cast including Japanese and non-Japanese performers, the evening provided a unique insight into the traditional art of Noh. 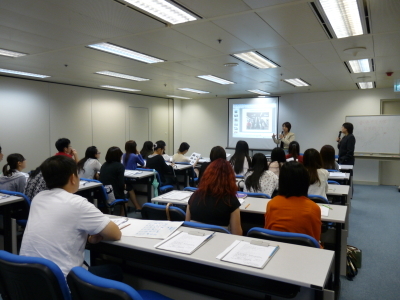 On Wednesday, 29 June, the Consulate General of Japan held an informative exchange briefing for a group of 30 students from the Chinese University of Hong Kong who are going to Japan to study for a year, either this September or next March. 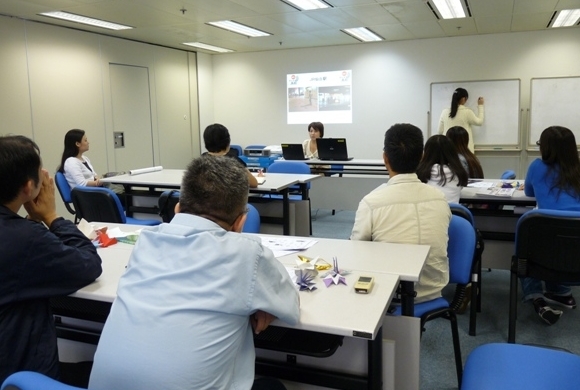 Consulate staff gave a talk covering a number of important subjects, including: visa applications, procedures for entering Japan, the criteria for taking up part-time employment while studying there, employment prospects in Japanese companies and the job market for foreign students in Japan. They also provided information on student travel opportunities, crime prevention and guidance on how to adjust to life in Japan. 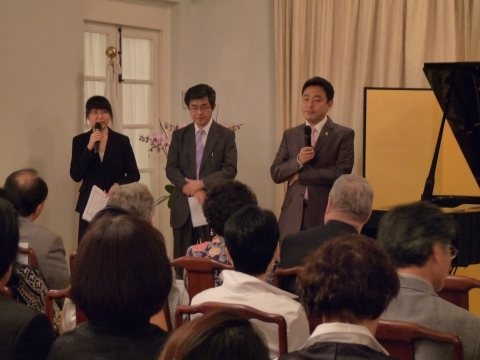 On Thursday 2 June, around 40 people, including members of the NHK Japanese Speaking Group, attended a Chopin piano recital by Mr. Yukio Yokoyama at the residence of the Japanese Consul General. Mr. Yokoyama is a renowned concert pianist. In 2010, in commemoration of the 200th anniversary of Chopin’s birth, he performed 166 solo works by the composer, from memory, in one 16-hour concert. In recognition of this unprecedented achievement, the Guinness Book of World Records gave him the world record for “most pieces of music performed by a solo artist in 24 hours”, and the government of Poland awarded him with the prestigious “Chopin Passport”. On 3 May, 2011, he performed all 212 solo works by the composer, again without sheet music, in a concert that moved and entertained the appreciative audience. On Thursday, 3 March, the Consulate-General of Japan welcomed students from Hong Kong Baptist University to a Japanese tea ceremony. 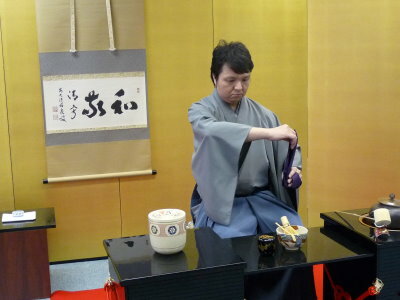 The ceremony, which was jointly organised with the Chado Urasenke Tankokai Hong Kong Association, took place in the consulate’s multi-function room. To celebrate the Doll Festival (Hina Matsuri), Hina dolls are displayed in the multi-function room while amazake (a sweet milky type of sake made from fermented rice) and hina-arare (popped rice frosted with sugar) are offered. 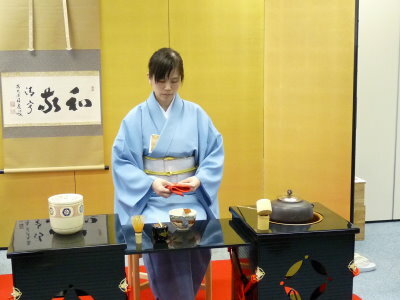 After watching a demonstration of the ceremony, the 25 students and teachers had a go at making some tea for themselves, and gained a valuable insight into this highly representative aspect of traditional Japanese culture. * Hina Matsuri is an annual event to pray for the happiness and healthy growth of young girls. It is celebrated on 3 March, and on this day, families display hina-ningyo (dolls dressed in traditional court apparel), along with peach blossoms and offerings of delicacies such as white saké, hishimochi (diamond-shaped rice cakes), and arare (dry rice-cake pellets). The Hina Matsuri observance derives from ancient beliefs about ritual purification. At one time it was believed that human misdeeds and defilements could be washed away and purified in rites held beside streams. Later, dolls made of paper were used in these rituals, and after the Edo period (1600–1868) these dolls began to be designed in the form of the hina-ningyo seen today. 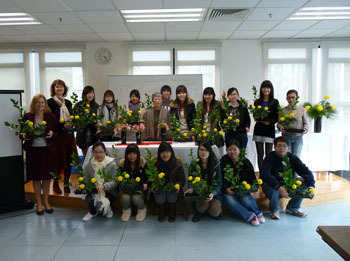 On Tuesday, 22 February, The Lingnan University played host to an ikebana (Japanese flower arrangement) demonstration and workshop arranged by the Consulate-General of Japan in co-operation with Ikebana International. 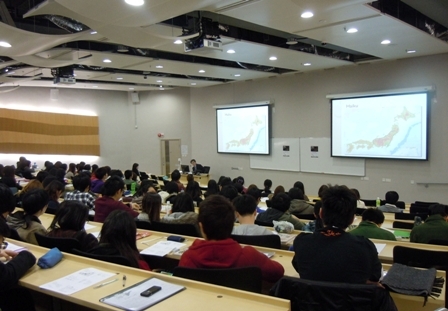 25 students and their lecturers attended the event. 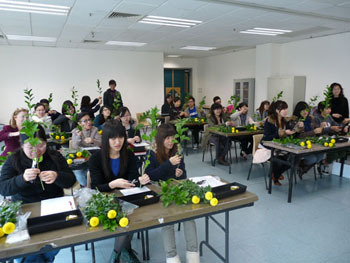 During the workshop, the students got the chance to create their own flower arrangements, and they made inspired use of vases and spiked holders for their designs. The students all gained a wonderful insight into this highly representative aspect of traditional Japanese culture. 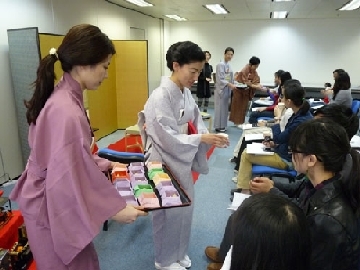 On Wednesday, 16 February, the Consulate-General of Japan welcomed students from Youth College (Kowloon Bay) to a Japanese tea ceremony. 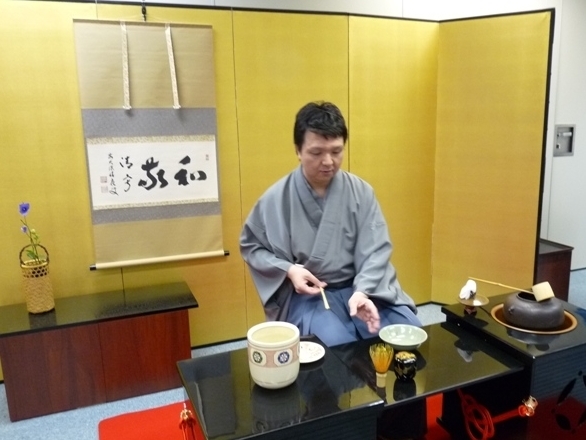 The ceremony, which was jointly organised with the Chado Urasenke Tankokai Hong Kong Association, took place in the consulate’s multi-function room. After watching a demonstration of the ceremony, the 30 students and teachers had a go at making some tea for themselves, and gained a valuable insight into this highly representative aspect of traditional Japanese culture.